Best Western Hôtel Montgomery Le Mont-Saint-Michel, Hotel France. Limited Time Offer! With a 32 room capacity with categories ranging from the total to the Suite) rooms, the Best Western Hôtel Montgomery is accessible starting at 96 US Dollars. It is situated at 13, Rue Couesnon in the south section of Mont Saint Michel, at only 19 minutes by car distance from the center. 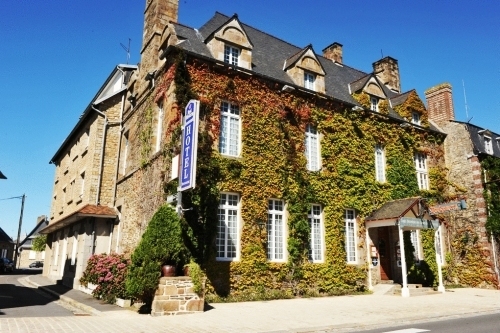 This Mont Saint Michel hotel is of a Family category and is a three star . You will find several amenities such as : Restaurant, Room Service, Bar, Non Smoking Rooms, Laundry, Free Parking. This hotel offers high speed internet. The Pleurtuit airport is about 85 minutes by car from the hotel (26 miles ). It is part of the hotel chain Best Western.Practical information: This hotel has a pay parking. Set in a prime location of Mont Saint-Michel, Domaine De Ville Cherel Hotel puts everything the city has to offer just outside your doorstep. The hotel has everything you need for a comfortable stay.